You'll be £19.99 closer to your next £10.00 credit when you purchase Fighting Brigadier. What's this? In the 1930s James Hill was forced to leave the Army because he was under 26 when he married. Recalled to the colours he won his MC with the BEF in 1940. He was one of the first to volunteer for airborne forces and became second-in-command of 1 PARA. He was in the thick of the expansion of Airborne forces in 1941-42 and took command of 1 PARA in North Africa, winning his first DSO. He converted 10th Bn The Essex Regiment to 9 PARA and later in 1943 took command of 3 Parachute Brigade, playing a major role in the D-Day Landings. Wounded twice his Brigade captured the key Merville Battery. The Brigade recovered to England in September 1944 before returning to Europe to contain the German winter Bulge offensive. In March 1945 his Brigade played a key role in the Rhine Crossing and raced east to block the Russian advance on Denmark. Post war Brigadier Hill was a leading figure in the Parachute Regiment and revered by fellow Paras. He died in 2006. Peter Harclerode was a serving officer in the Guards and Paras. He is a much published author who concentrates on Special Forces. He lives in Suffolk. A truly remarkable man who is recognised as one of the founding fathers of the Parachute Regiment. 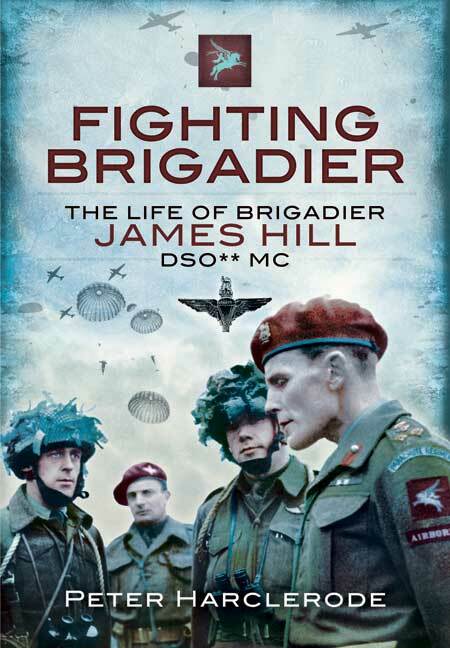 This is an excellent study of his life and his career in British Airborne Forces. A much overdue account of the wartime career of James Hill, who had a profound influence on the airborne movement and led paratroopers with considerable skill throughout the war. Hill's own words feature strongly in the first part of the narrative, dealing with his experiences in France with the British Expeditionary Force and the 1st Parachute Battalion at the beginning of the Tunisian Campaign. The second part is more so an account of the actions of the 3rd Parachute Brigade in Normandy, the Ardennes and Germany, again interspersed with Hill's lively recollections. Brigadier James Hill was an important figure in the Parachute Regiment during the Second World War, joining soon after the British airborne forces were created, and rising to lead 3rd Parachute Brigade from Normandy to the Baltic. This book falls into two somewhat different parts. Hill is at the heart of the text in the first part of the book, up to the point when he leads 3rd Parachute Brigade into battle. The second part of the book is more of a history of the Brigade and the wider battles in which it took part. Hill is sometimes a background figure in these sections, emerging most often in extracts from his own writings (these are used extensively and are of great value). As a result the book is of rather wider interest than might have been the case if it had focused very closely on Hill's personal role in the action at the expense of the wider picture. It also accurately reflects the increase in the size of the forces involved, from the 1st Parachute Battalion of October 1942 to the 3rd Parachute Brigade, itself part of an Airborne Division and an entire Airborne Army. TheFighting Brigadier is the account of the life and campaigns of a very remarkable man who, in the words of a former senior officer in the Airborne Forces, was 'the founding father of The Parachute Regiment'. His life started in 1931 when he was commissioned in to the Royal Fusiliers. In 1939 he won his MC with the British Expeditionary Force in France. He joined the 1st Parachute Battalion as second in command in May 1942; commanding by October, he took the Battalion to North Africa where he earned his first DSO. Promoted to Brigadier he formed 3rd Parachute Brigade, commanding them through Normandy. Throughout the rest of the war he earned many more bars and achievements. He passed away in 2006 - to remember him there is a life size bronze statue at Pegasus Bridge; a fitting memorial to a true Airborne warrior. The areas which do feature the Brigadier were interesting and although much of it is known, there are some fascinating pieces and certainly the addition of detail to what is currently in print. The accounts of 1st Airborne Division men who served with him in North Africa are very interesting, particularly that of his former adjutant, Major Miles Whitelock. During my own former career in the British army I served with a wide variety of different regiments and corps - most notably, however, with Airborne Forces which included 22 SAS and all three battalions of the Parachute Regiment and I look back on those days with great pride. A fair number of officers from that regiment have achieved high office - some of whom even became household names; The late redoubtable General Sir Anthony Farrar-Hockley and, more recently, General Sir Mike Jackson (to name but two!). Although still mentioned with the greatest respect within the Regiment, Brigadier James Hill is not one of those names which spring readily to mind in that regard but, if there were any justice at all, his would always be the first. One of the few men ever to win three DSOs (in addition to an MC), James Hill was one of the founding fathers of the Parachute Regiment itself and also the Regimental Association on the council of which he served for an incredible 30 years. Commissioned into the Royal Fusiliers in 1931, he was one of the first volunteers to answer Churchill's call for a new force of airborne soldiers. His first appointment was 2IC of 1 Para in May 1942 but by October he was in command of that battalion. Badly wounded in North Africa (where he earned his first DSO) he was medevaced to UK before assuming command of the newly formed 9 Para in early 1943. On promotion to brigadier, he created 3rd Parachute Brigade which he commanded in Normandy. Always leading from the front he was wounded again (twice!) and earned the first bar to his DSO. In 1944 his brigade took part in the Battle of the Bulge. In March 1945, Hill's tactics were central to the successful crossing of the Rhine followed by a race to the Baltic in a bid to get there ahead of the Russian advance. For his outstanding leadership at that time he received his third DSO (i.e. his second bar), the US Silver Star and the Norwegian Liberty Cross. James Hill died in 2006 at the age of 95 and today, a life-size bronze statue of him stands beside Pegasus Bridge at Ouistreham. There could be no finer tribute to such a gallant officer. For those who are interested in this hugely informative and well-crafted biography by author Peter Harclerode, all the above information was found inside the book's front dust cover. It is a brief synopsis which provides a foretaste of a book which brings those salient milestones to life as we re-live the military career of an outstanding leader of men. Money attracts money, fame attracts fame and for Brigadier James Hill it certainly seemed that Glory was an inherited trait. This is not the rise from back-to-back house foot soldier to brave and gracious leader but a man following in his distinguished father's footsteps and then pursuing one incredible feat after another. Some people are destined for greatness, others strive for it, but For James Hill it was in his blood. For the first time, Peter Harclerode delivers this truly amazing chronology of a man, well respected, strong of heart and previously unsung for his heroism and takes us to the very heights of his achievements. Harclerode's ability to set the mood effortlessly wraps us in the darkness of war, afflicting us with the very tensions felt by the men in the battalions and is an altogether gripping read. This is a very descriptive and long time coming biography and memorial to one of the glorious heros of our time.